My friend, who is in farming at the moment, recently received a cheque for ‘3,000 from the Rural Payments Agency for not rearing pigs. I would now like to join the ‘not rearing pigs’ business. 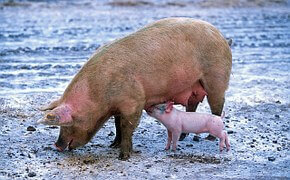 In your opinion what is the best kind of farm not to rear pigs on, and which is the best breed of pigs not to rear? I want to be sure I approach this endeavour in keeping with all government policies, as dictated by the EU under the Common Agricultural Policy. I would prefer not to rear bacon pigs. But if this is not the type you want not rearing, I will just as gladly not rear porkers. Are there any advantages in not rearing rare breeds such as Saddlebacks or Gloucester Old Spots, or are there too many people already not rearing these? As I see it, the hardest part of this programme will be keeping and accurate record of how many pigs I haven’t reared. Are there any Government or Local Authority courses on this? My friend is very satisfied with this business. He has been rearing pigs for forty years or so, and the best he ever made on them was ‘1,422 in 1968. That is ‘ until this year, when he received a cheque for not rearing any. If I get ‘3,000 for not rearing 50 pigs, will I get ‘6,000 for not rearing 100? I plan to operate on a small scale at first, holding myself down to about 4,000 pigs not raised, which will mean about ‘240,000 for the first year. As I become more expert in not rearing pigs, I plan to be more ambitious, perhaps increasing to, say, 40,000 pigs not reared in my second year, for which I should expect about ‘2.4 million from your department. Incidentally, I wonder if I would be eligible to receive tradable carbon credits for all those pigs not producing harmful and polluting methane gases? I am also considering the ‘not milking cows’ business, so please send any information you have on that too. Please could you also include the current Defra advice on set aside fields? Can this be done on an e-commerce basis with virtual fields (of which I seem to have several thousand hectares)?